The word Qur’an means "recitation” and according to Islamic belief is a divine revelation made to prophet Muhammad (SAWS) through the angel Gabriel, in a fragmented form, in a period of 23 years. 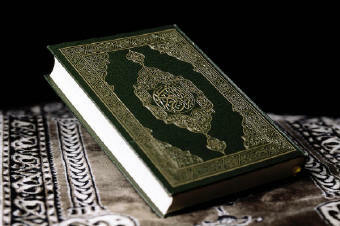 The Qur’an is composed of 114 chapters called "surah" in Arabic. Each surah is composed of several verses called in Arabic "ayahs", word that means "miracle and sign". It is the first source of the Islamic Law and functioned as a kind of Constitution for the first Muslim community. The coranical revelations had been registered in rudimentary materials during the life of prophet Muhammad (SAWS). After his death the Caliph Abu Bakr placed Zaid Ibn Sabet in charge to prepare a copy of the text of the Qur’an, in a book form. There were at that time some Hafizes (title given to those who know the Qur’an by heart) and Zaid was one of them. This copy received the name "Musshaf" (bookbinding) and was kept under the safekeeping of the Caliph Abu Bakr himself, and after him under his successor, the Caliph Omar. The Qur’an assumed the definitive form of a book about twenty years after the death of the Prophet (SAWS), in the government of caliph Uthman, who put himself in charge of sending copies of the authentic text to other cities. Although many critics of Islam try to raise the hypothesis of a possible alteration, the confrontation with older Qur’ans confirms that it remained unchanged and that it corresponds to the currently recognized Qur’an in the Islamic community. For Muslims, the Qur’an as irrefutable source of Islam and considered as original is in Arabic language. The various translations are not considered Qur’an, but meanings of it, many times badly translated. Some present so great discrepancies that modify the meaning of a verse. The biggest obstacle for a good translation is the richness of the Arabic language. Even Muslims, who have the Arabic as their native language, when engaged in a deeper study, make use of an Arabic-Arabic dictionary that explains the specific meaning of a determined word in the context of each verse. Muslims believe that the Qur’an synthesizes and perfects the earlier revelations, making possible to distinguish between truth and falsehood, not in the form of dogmatic assertive nor condemnation of other religions, but with the distinction between the human artifice and the essential meaning of the religion, between hypocrisy and true faith. The reading of the Qur’an requires an indispensable initiation and a preparation for better understanding, especially in the case of a non-Muslim reader. Try to understand the Qur’an based only on oral information or specific parts and not in its text as a whole, will lead the unprepared reader to a distorted understanding. It is important to remark that the Qur’an had not been compiled in the order of its revelation. The order of the verses in one surah and the order of the surah inside the Qur’an had been determined by Prophet Muhammad (SAWS) through divine inspiration, in accordance with the Islamic belief. The unfamiliarity of this fact tends to generate distortions in the understanding of the Qur’an. Throughout three centuries the Qur’an unchained and fed social and political convulsions, intellectual and moral evolutions, scientific and religious speculations. The knowledge of its content represents a safe starting point and primary information for the examination of stereotypes about Islam. Due to the broadness of its content, the joint effort of the philologist, the historian of religions and the sociologist have been necessary for a more accurate analysis of the elements that constitute the Sacred Book of Muslims. Text by Maria C. Moreira & Marcia Vianna Gaspar.